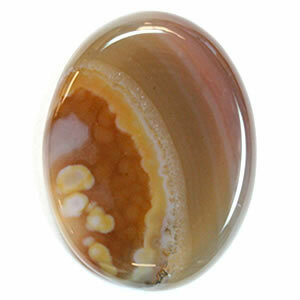 A Brazilian agate cabochon that was sanded and polished in a vibratory rock tumbler. You can save ten to twenty minutes per cab by letting a tumbler do the fine sand and polish. The tumbler will also polish the back and nicely camber the edges. It will produce a very uniform polish if your objects are made from a material of consistent hardness. If you cut cabochons, beads or other small lapidary items you might be able to save a lot of time by allowing a rock tumbler to do the final sanding and polishing steps. A tumbler will produce a uniform, super bright polish on almost any small, smooth object made from agate, jasper, quartz, petrified wood or other lapidary material with a Mohs hardness between about 5 and 7. The Brazilian Agate cabochon at right was cut to shape using a rock saw and diamond wheel, then briefly sanded on an expanding drum to remove ridges left by the diamond wheel. It was then placed in a rock tumbler for final sanding and polishing. The result is a cabochon with a fantastic polish, smoothly cambered edges and a nicely polished back. The rhodonite cubes (below right) were cut on a rock saw, then sanded and polished in a rock tumbler. With very little labor you can sand and polish hundreds of 1/2" cubes simultaneously in a rock tumbler. Let's say that you have a couple hundred small rhodonite cubes (or beads or cabochons) that are up to about 1" in size or smaller. These are straight off of a rock saw or a grinding wheel with no additional sanding done. Your goal is to sand them smooth, gently round the points and edges, and achieve a very bright polish on all outward-facing smooth surfaces. 1) Run them for two days in a single Lot-O-Tumbler with ceramic media and two ounces of medium silicon carbide grit. Rinse and add fresh grit about once a day. 2) Thoroughly rinse and run for two days in fine silicon carbide grit. Check a couple times per day and add water if needed. 3) Thoroughly rinse and run for two days in TXP aluminum oxide polish. Check a couple times per day and add water if needed. 4) Rinse, dry, separate cubes from ceramic cylinders and admire your great polish! 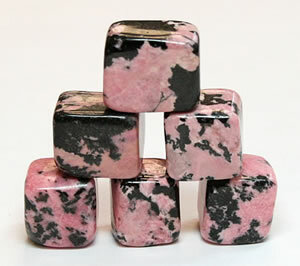 These rhodonite cubes were cut on a rock saw, then sanded and polished in a rock tumbler. Imagine how long it would take to polish these by hand and round the points and edges! Mass finishing in a tumbler works great if all of the items you are polishing are smooth, simple shapes (such as cabochons or cubes) and are of uniform hardness. Complex shapes do not polish well. Protrusions are shortened, surface textures are smoothed, tiny nooks and crannies are missed, and concave surfaces are lightly done if done at all. If the items that you are tumbling have zones of harder or softer material, they will sand and polish at different rates. Hard materials will stand up in positive relief. Soft materials will be worn away. It is best to experiment with a few unimportant pieces before you go into mass production with valuable items. For mass finishing use a tumbler that is large enough to process your materials. Cushion your items with lots of ceramic cylinders. A vibratory tumbler smooths surfaces quickly, preserves the original shape of your items and uses less grit. A rotary tumbler rounds protrusions, takes longer and uses more grit. If we were going to tumble a lot of preforms we would use a Lot-O-Tumbler or a Thumler's UV-10. These are both vibratory tumblers that will work fast, use very little grit and be relatively gentle on your items. The UV-10 will process pieces up to about 2 3/4" across, and the Lot-O-Tumbler takes pieces up to about 2". We recommend using lots of ceramic cylinders when tumbling fragile items. Use small cylinders if you have small objects or objects that have lots of fine detail. When processing new materials don't hesitate to spend time experimenting and planning ? that's how you get the best results. Good luck!